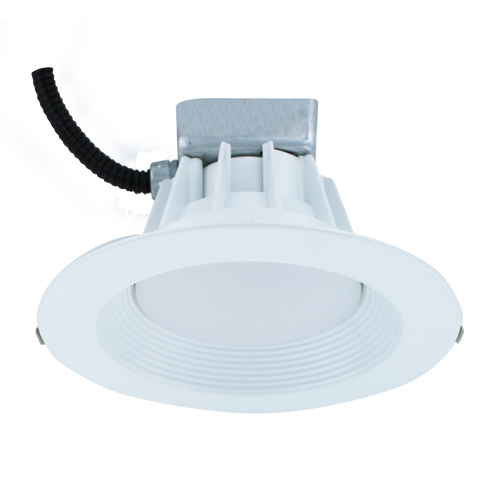 The DECO DRT-6 Lumen+ unit is a six-inch LED recessed downlight kit delivering high performance white light optimized for new construction and retrofit applications. Installation is done quickly and easily in most standard eight-inch frames. The top-quality DRT-6 Series provides excellent color rendering (94 CRI) at 4000K. LEDs have virtually no UV or infrared radiation to damage or fade furnishings, art or other objects. Optical Design Optical design efficiently directs light output in an 80° beam angle with low glare. 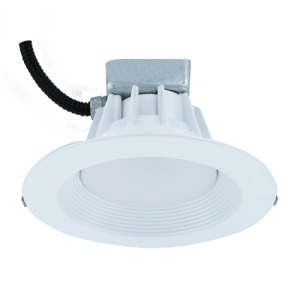 The DECO DRT-8 Lumen+ unit is an eight-inch LED recessed downlight kit delivering high performance white light optimized for new construction and retro t applications. Installation is done quickly and easily in most standard eight-inch frames. The top-quality DRT-8 Series provides excellent color rendering (84 CRI) at 4000K. LEDs have virtually no UV or infrared radiation to damage or fade furnishings, art or other objects. Optical Design Optical design ef ciently directs light output in an 80° beam angle with low glare.